Reduce acne and acne scars! See noticeable results in as little as ONE treatment! 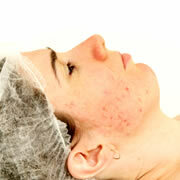 This treatment is ideal for oily acne and acne scarring sin types. Peeling may occur for 3-5 days. The results can be seen within 1 treatment. The skin will be smoother in texture and more even in skin tone. The number of treatments will be determined by individual skin conditions. A home care regimen is essential to maintain results.